Google Adwords is an online advertising service developed by Google. Advertisers pay here to display brief advertisement s, service offerings, product listings and video content to the web users within the Google ad network. Its system is based partly on cookies and partly on keywords determined by the advertisers as well. In this system advertisers bid on certain keywords for their clickable ads to appear in Google’s search results. Google Adwords is a paid online advertising product of Google. You have to pay here whenever the viewers click on your ads. Your account won’t be considered as active without entering your billing information. Even if you have redeemed any coupon, it won’t be considered as active. Google Adwords is also the largest and most widely used online advertising network in the world. Millions of businesses advertise online to reach new consumers and grow the businesses using AdWords. By bringing huge per click traffic through the use of proper keywords, Google AdWords makes your marketing task a whole lot easier. It offers assured, immediate traffic to web sites against a certain investment. Therefore using this campaign comes with a host of advantages for businesses and websites. It offers a Pay Per Click (PPC) advertising campaign that includes ad programs with local, national and international distribution too. 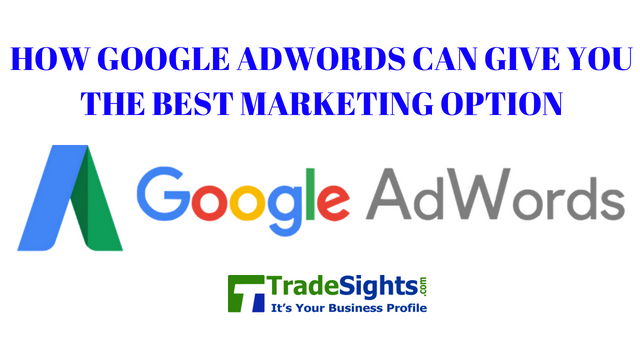 Here are some ways through which Google AdWords can give you the best marketing option. Google Adwords is popular just for this reason. It comes with a small initial investment. To create an AdWords account, you need to pay only a small amount. Thereafter you can bid on the nest keywords. The payment is billed only against clicks after the creating of Google AdWords account and releasing the content are completed. There is no loss if keywords generated are perfect. Another important reason for why Google Adwords is used is defining budget. Reducing any overspending you can set your own budget with Google Adwords and monitor your budget. Any keyword that performs well can be bid high for better result therefore. During a crisis you can control your budget too. Google AdWords comes with a Return of Investment as well. it means you need to pay Google Per click that suggests your investment is returned against assured trades. It increases click through rates and visits. Therefore there is a greater chance of business as well. Google AdWords ROI makes people pay only for business and profit. So, the evident loss can be controlled. One of the important and very useful aspects of Google Adwords that serves as a major reason behind the use of the Google Adwords campaign is targeting traffics. You can bring targeted traffic directly to a website by using it. A serious audience will end up clicking these links as ads are displayed along with a defined title and description. The target traffic can be defined as per location and places. You can specify a definite keyword for a specific location too. It increases the rate of visits and conversion that improves the business of a site excessively. You can track your success and take effective measures whenever you require by using Google Adwords. Google analytics can track the reports of the Google Adwords campaign against keywords. You can track its report and place it prominently with a high bid in future to increase traffic towards a profit-making business as well. Else a keyword or a campaign that fails to bring expected traffic can be removed for further usage in future. It’s very important to generate the best keyword for a specific target market. People should be specific about generating the best keywords. The chosen keywords must convert to sales. Location targeting is one of the most important and useful components of implementing a successful PPC campaign as well. the features that come alo9ng with the Google AdWords campaign highlight its importance for your business on internet. How does e-commerce website work?????? Why you should register your business with TradeSights? Free Business Listing Or Own A Website, What Is Better For A Small Business??? Copyright © 2015 TradeSights.com . Powered by Blogger.